For what ever reason these to despise one another. The match was extremely physical with St. Louis’ own, Randy Orton, taking control of the Celtic Warrior early on. As he fed off the energy of the crown, Orton tore into his opponent and things looked bleak for Mr. Money in the Bank. But Sheamus was able to shut Orton down with three consecutive, Irish Curse Back Breakers. With offensive momentum now in his full control, it was the Irishman’s turn to deliver a beating to his foe. But the two men know each other well and once again Randy was able to battle back. The two would then go back and forth and the action spilled out of the ring. The Viper gained the upper hand and sent Sheamus crashing into the announce desk. Sensing his opponent was nearing his end, Randy rolled him back into the ring and went to end the fight with an RKO. However, Sheamus countered with a Brogue Kick, but rather than go for the victory, Sheamus locked in his Cloverleaf submission. Despite the excruciating pain of the maneuver, The Viper crawled towards the ropes. He further exhibited in human pain tolerance as he was forced to crawl tot he ropes again, after the Celtic Warrior pulled him from the ropes a first time. Forced to break the hold, Sheamus pulled Orton to his feet, but what ever he had had planned went out the window as Randy struck with an RKO out of now where to win the match in front of his hometown crowd! I do enjoy a physical fight. And these two never disappoint. Sure, the WWE Universe has seen these two fight numerous times (they don’t like each other so constant fighting is bound to happen) but they are constantly evolving. I can’t tell you the last time I saw Sheamus attempt to fly. Granted he takes to the air bout as well as a boulder, but he sure did try something new to attempt to put his long time foe down. Unfortunately for Mr. Money in the Bank, his opponent was Randy Orton, the man who can and will hit an RKO Outta Nowhere. Where do these men go from here? Good question, but with Summerslam looming, I bet we will soon find out. The New Day set to prove that the power of positivity could over come all as they took on the Prime Time Player in an effort to become two time WWE Tag Team Champions. 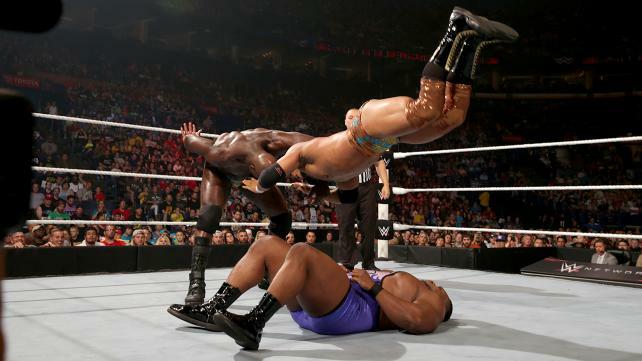 The New Day were quick to take control in the opening moments of the battle as they dominated Titus and Darren. However, the champions showed their resilience and fought back and showed amazing team work when Titus picked Darren up and used him as a weapon on Big E. This rocked the challengers as they lost the upper hand. But what was lost was soon found again as the strongest member of the New Day over powered Young and tossed him to the floor out side the ring. But the big man was no where near finished as he then hit a big splash from the ring apron onto one half of the Tag Team Champions. Pretty straight forward match. While it was a good match there wasn’t much that made you go oooo and ahhhh. I want to see who else could be a threat to the Prime Time Players now that the New Day has been beaten, again. Not even the numbers were enough to return the titles to the clapping trio. Other teams that could be a legit threat to the PTP? I see the Lucha Dragons coming into play, I’d love the Ascension to get their act together and remember that they were the most dominant tag team down in NXT and should be running the main roster’s tag team division. Either way, the division is open and the Prime Time Players are ready to defend their WWE Tag Team Titles. There was not a match more emotionally charged than the war that took place between Roman Reigns and Bray Wyatt. From the moment the bell rang, it was a test of strength between both men. Size and strength near equal, it came down to Roman’s anger fueling his desire to beat Wyatt to a pulp for all the torment of the past few weeks. Reigns’ was relentless and vicious in his attacks on Wyatt as he held control for the majority of the match. But Wyatt was no push over. In his bid to show the world that Reigns was not all he claimed to be, he battled back and suckered Roman in a few times and shut down the freight train that was Roman Reigns. The most devastating of which being a counter to the Power House’s basement drop kick. As Reigns came in to deliver his signature move, Wyatt sprang up from his position and clotheslined the Samoan. Roman landed hard on the ring apron and that is when Wyatt took full control. Reigns however caught a second wind and powered his way out of a sleeper and began to reign destruction on the new face of fear. His anger got the best of him as he exited the ring and showed exactly what kind of influence Dean Ambrose is on him as he began to fill the ring with steel chairs. Unfortunately, he would never make use of them as a hooded figured appeared and attacked Roman. This allowed Wyatt to take advantage and deliver a Sister Abigail to pick up the victory. It was then revealed that the hooded figure who delivered the super kick to end Roman’s night was Luke Harper!! Yes ladies and gents, the band is BACK together. The Family takes care of its own and now Luke Harper has returned to his leader’s side. The match itself was an amazing battle. many cringe worthy moments as the WWE universe became sure that both men were set on ending the career of the either. And most likely they were, but it was still not an easy thing to watch at times. The Roman Reigns that entered the ring had the feel about hi of Roman of old. The Roman who was the seething volcano of the Shield. How we have missed him. Bray Wyatt ever the mental tactician used everything at his disposal to get the win. And lets be honest, his victory looked like a pipe dream there for a second. So with the Wyatt Family back together, I see Dean and Roman continuing their bromance in an effort to get retribution on the loss that Roman picked up at Battleground. Tag match at Summerslam perhaps? Earlier in the evening, Stephanie McMahon gave an interview. The jist of it being that each of the new 3 woman Divas team were to pick a representative who would complete in a triple threat match that night. The three who would compete were, Charlotte, Brie Bella, and Sasha Banks. These three Diva’s tore the house down! Brie and Sasha double teamed Charlotte at the beginning and then tore into one another. But soon Brie was dispatched and then it was The Boss taking on The genetically superior Diva. Charlotte and Sasha have put on some awe inspiring matches and this one was no different. The two battled and traded offensive flurries. As Brie attempted to come back in at one point she was dispatched yet again. But the representative from Team Bella would not stay down. She entered the fray and showed that she was no push over. At one point, amid YES chants, Brie delivered kicks to her opponents that were straight out of her husband’s play book. But these ladies were no where near finished in showcasing their abilities. Both Sasha and Charlotte took to the air and onto foes from the ring to the floor. The end of the match came when Charlotte locked in the Figure 8 (cuz it’s twice as good as her daddy’s figure 4) on Brie Bella who was forced to tap to the excruciating move. For the first time I can remember, a main roster Diva’s match is in contention for match of the night. Charlotte may have gained the victory for her team, but it was the WWE Universe that ended up winning. If this is any indication of what the Diva’s division is turning into, then I say bring it on! I simply am chomping at the bit to see what else these talented women have to offer. Perhaps one of the most hotly anticipated matches of the evening (save the main event) United States Champion was in action against Kevin Owens. As the bell rang, Owens was on the champion hoping to shut it down early and in a decisive manor. But The face that thinks it runs the place weathered the storm and began to mount an offense of his own. The two men fought hard and pulled no punches. High risk maneuvers were countered into higher risk and more painful moves that left the WWE Universe wondering how either of these men were able to kick out at 2. Both Cena and Owens pulled out moves that left the crowd and those at home wondering where the heck that came from or what the heck do you call that! All in a concentrated and focused effort to once and for all put the other man down. It was an insane contest that kept the entire WWE Universe on the edge of its collective seat as near falls abound from the high impact innovative moves being preformed on one another. The two showed that they knew the other well as KO countered the spring board stunner with a clothesline. This allowed Kevin to gain control of the match once again. But Cena tapped into his unnatural powers and was able to land a SECOND AA on the challenger. But once again. Owens kicked out much to the disbelief of the United States Champion. A few minutes later it was Owens’ turn to wonder what it would take to put the Champion down as Cena would later kick out of the Pop Up Powerbomb that had put so many others down, Cena included. The two would continue to lay into one another and John gained the upper hand once again and delivered an AA from the top rope, and once more Owens refused to stay down. KO then almost became the new United States Champion as he caught Cena unaware and rolled him up for a 2 count. The end came for the challenger when Cena locked in the STF on Owens in the middle of the ring. Try as hard as he could, Kevin was unable to claw his way to the ropes to break the hold and he was forced to tap. Seriously? *growls* Owens was my best shot in a long time of finally putting the nuisance that is John Cena down. Once again though, Big Match John showed up and used his powers of evil to destroy my challenger. The match was an insane roller coaster ride of ups and downs. Near falls a plenty, high impact moves abounded, and disbelief on both sides as each man dug deep into their arsenal to destroy the other. With this victory over Kevin Owens, who else is going to step up and attempt to rid us of the delusional evil that is John Cena? One might think Dean Ambrose would be a natural selection. He did hold the title longer than anyone else. And a part of me still sees that title as Dean Ambrose’s. But with the Wyatt’s becoming family again, I don’t see Ambrose leaving Roman to fight that battle alone. So who would be a legit contender? There is Rusev who nearly beat the champion, or perhaps Cesaro? Either of them would be preferable to John Cena. So… This was painful on so many levels to watch. Brock Lesnar dominated the entire match. There is no way to sugar coat that or spin it, it was brutal and down right uncomfortable at times. Our beloved WWE World Heavyweight Champion, Seth Rollins did all he could to avoid that first suplex. But once he was caught, and it was delivered, more soon followed. But the heart of the Champion refused to give up as even as he was suplexed around the ring, he found ways to fight back and got off a few offensive flurries that concentrated on the Beast’s leg. Unfortunately, even as Seth countered suplexes and fought back, it was no where near enough as again the Beast took over and shut Rollins down. Just as it seemed Brock was about to pick up the win after he delivered an F-5 to the champion, the lights went out! When they came back up, Seth Rollins was gone, and in his place stood The UNDERTAKER!! Brock Lesnar may be the god of violent retribution but the Undertaker is the Deadman and you can not kill the Phenom. He never forgets the wrongs done to him and he will always make them right. Brock Lesnar discovered this as he was chokeslamed and given 3 Tombstone Piledrivers. Ladies and Gents, the REAL Big Dog has returned to claim his yard and Brock Lesnar is on his list of wrongs to make right. So… Bullet dodged right? The faithful who support Seth Rollins need to come together and thank the Undertaker, send him flowers or something. Sure he may not have done it to save Seth, but the result is, Rollins is still champion leaving Battleground. As he stated he would be. Who knows, this could have been his plan all along. (Yeah I’m reaching but I really don’t care.) I know I marked out big time when Taker appeared. The Dead man destroyed the Beast. I simply can not wait to see what is in store for the future. This entry was posted on Monday, July 20th, 2015 at 12:30 pm	and is filed under Events, News, Television. You can follow any responses to this entry through the RSS 2.0 feed. You can skip to the end and leave a response. Pinging is currently not allowed. « ‘The Revenant’ Trailer Teases Oscar-Worthy Performances!! !